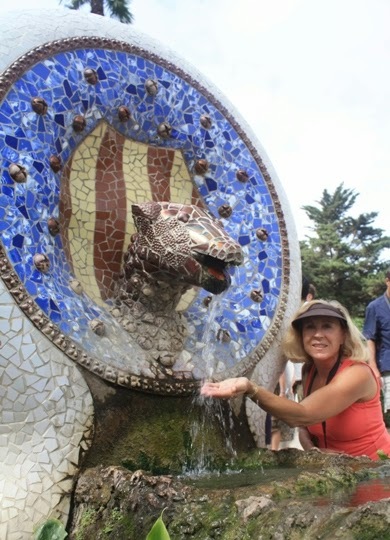 GOING ON ADVENTURES: Is Gaudi's architecture in Park Guell truly creative--or just gaudy? 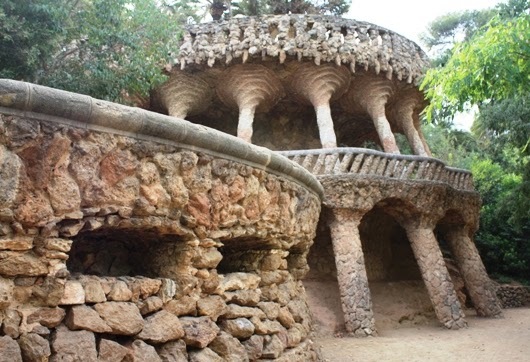 Is Gaudi's architecture in Park Guell truly creative--or just gaudy? Antoni Gaudi, famed Spanish architect, believed if he could imagine it, he could create it. 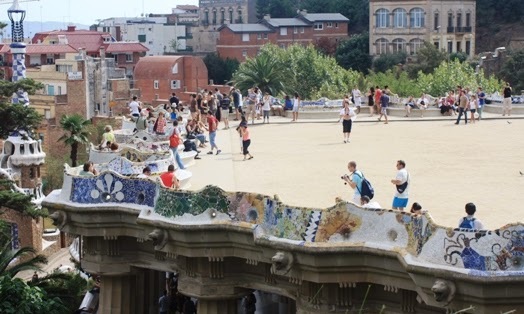 Nowhere is that philosophy more evident than in Barcelona, Spain’s ParkGuell, a fanciful urban space with buildings, paths, and stone steps leading to multiple levels that reflect Gaudi’s imaginative visions shaped by the curves and forms in nature. 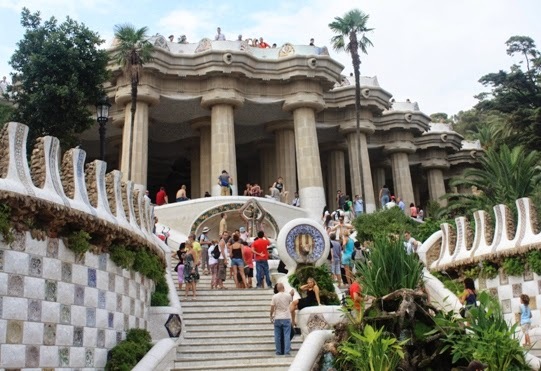 Open to the public and free, Guell Park is one of Barcelona’s most visited attractions. It’s an opportunity to get up close and personal with Gaudi’s fantasies, including the Hansel and Gretel chocolate house that was inspired by fairy tale images. many fanciful creations in Park Guell in Barcelona. As you enter the park, take the opportunity to stand on the staircase beside a multi-colored tile-covered dragon fountain for a photo op. Then follow rustic stone columns and arches that lead visitors up and around the park. Polychromatic mosaics invite you to sit on famous undulating benches facing the sea. Deep color combinations or white monotone tiles contrast with rough hewn stonework. Spectacular views abound at this vantage point, a great spot to simply sit and reflect. elaborately decorated with multi-colored tile designs. We continued upward to the church on the top of a hill, marveling at the enormity of the park, admiring the large number of sculptures (metal and stone), and enjoying musicians entertaining visitors along the way. Signature Gaudi construction elements of curves and mosaics form notable landmarks throughout the park. Rugged rocks are transformed into incredible arches and fences in which complicated designs blend seamlessly into the natural landscape. We took time to stop to look closely at the countless intricate details incorporated into Gaudi’s larger designs. Spectacular rock work is a hallmark of Park Guell in Barcelona. Colorful tiles cover railings, benches, walls, ceilings, and statues, making a bright contrast with earthen colors of the reddish-brown rocks. The monumental hall features a ceiling completely covered with broken tile pieces in a design of several “suns” shining down. It’s a wonderland of creativity—yes, even “gaudy” at times. Ocean blue tiles decorate this fanciful fountain. Named for the family who were Gaudi’s patrons, Park Guell was originally intended to be an English style garden city of 60 homes, but only two were completed. The house where Gaudi lived from 1905 to 1925 is now a museum featuring furniture he designed and drawings of his many projects. 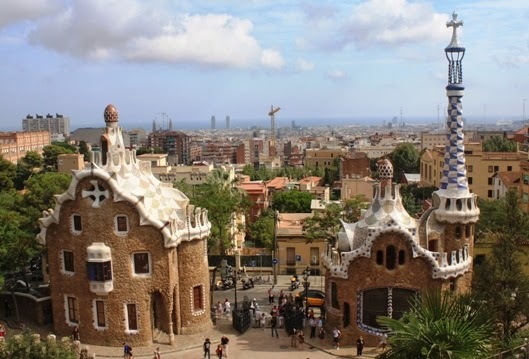 Even if you’re not a fan of capricious design elements, you’ll appreciate the amount of work that went into creating Park Guell, one of the largest architectural compounds in southern Europe and a icon in the city of Barcelona. Thanks for taking me back to Parc Guell with your lovely post!